The only remnant of Parbroath Castle is a fragment of a vault standing in a field 300 yards SW of Parbroath farm. 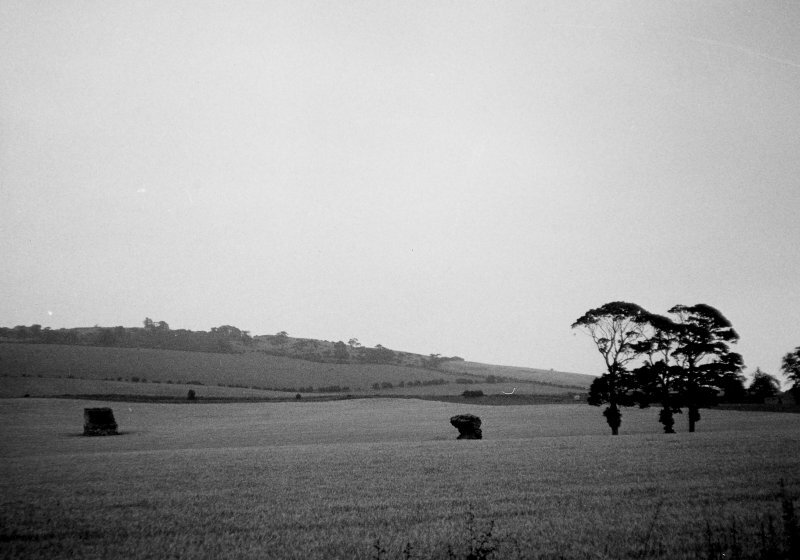 However, the ditch of a roughly triangular bailey that has enclosed the castle is visible as a crop-mark on air photographs (Visible on RAF air photographs 541/A/474: 4010-11). It measures 600' long by 400' max width with one corner S of the main Newburgh-Cupar road. In 1512 the estate of Parbroath became royal property through non-entry for 50 years, and James IV then gave it to John Seton, and numerous charters were dated from the mansion in the 15th and 16th centuries. RCAHMS 1933, visited 1925; A H Millar 1895; Information from notes by K A Steer, 1954. The remains of Parbroath Castle consist of a wall fragment of freestone, 8.0m long by 3.0m high and 0.8m thick at base, showing the commencement of a barrel vault. Some small stones are scattered about 12.0m E of the wall, but there are no definite traces of foundations. Course of bailey plotted from air photographs, no trace on ground. Visited by OS (D S) 2 November 1956. Visited by OS (R D) 26 May 1970.